Pictured: Examples of the types of micro-certifications that SMART integrates into FIRST competitions. The table pictures the types of tasks that prior research found that highly skilled robotics technicians worked on daily. SMART integrates these tasks into measurable micro-lessons and certifications. 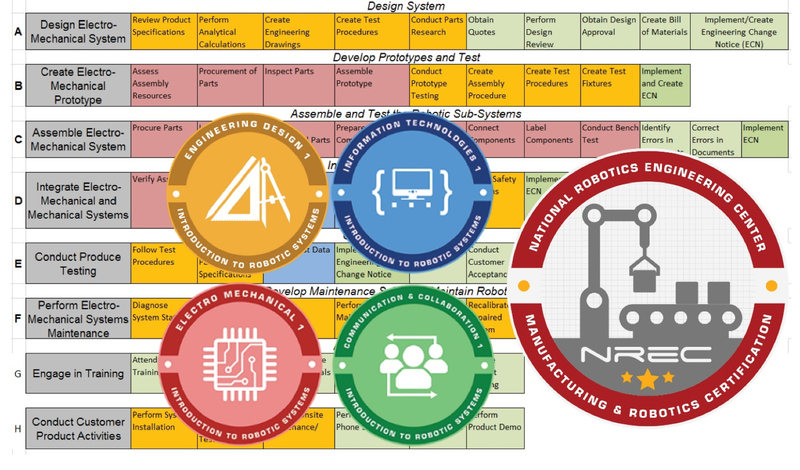 SMART industry partners help to develop the lessons and assessments that students can learn either via FIRST, or in a robotics class. These competencies will be taught via SMART high school level curricula that is integrated into a CMRA’s LMS. SMART takes advantage of CMRA’s CS-STEM Network Certification System (CS2N), an inexpensive custom built LMS. CS2N enables all stakeholders, students, teachers and mentors to track students’ progress. SMART organizes the lessons and activities in CS2N enabling students to earn parts of certifications in class and other parts of certifications as they work on their robots. When they complete a physical task they have the opportunity to upload example work into CS2N. Students’ can upload evidence of their accomplishments (i.e. drawings, programs, schematics, pictures, PERT charts, anything that can be digitized) as they complete them. The evidence is attached to students’ digital certifications. Students can share their certifications, and evidence of their work with future employers. The system described above is already in operation for other CMRA courses/certifications, CS2N has awarded over 1.4M badges and 11 thousand certifications. Students that earn all of the Micro-Certifications, receive a teacher endorsement and pass the certification exam earn the Introduction to SMART Systems Certification.